Because Bok Choy is so similar to celery in shape and since we'd be pitching its base in the compost bin already, we figured we had nothing to lose by trying — and as you can see, we sure are glad we did! 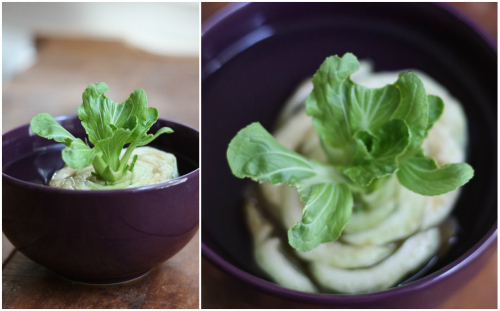 Just like the celery growing tutorial, we simply chopped the Bok Choy we'd be using for dinner from the base and placed it face up in a small bowl of warm water to sit. It's that simple, and that amazing. We'll soon transfer this newly growing Bok Choy over to a container of its own to continue growing in soil. Tim has just the recipe in mind for this little guy from when we both took a two week vegan challenge and made this Stir Fried Bok Choy with Mizuna. Since it's the first time we've tried regenerating plants like these, we're not sure how many times over it works, though being able to save 2-3 purchases over time is worth it enough for us! Projects like these are also a great way to teach children in a fast way how plants and food can grow. If any of you have had luck regenerating other vegetables in a similar way, let us know since we are having too much fun giving them a whirl! P.S. 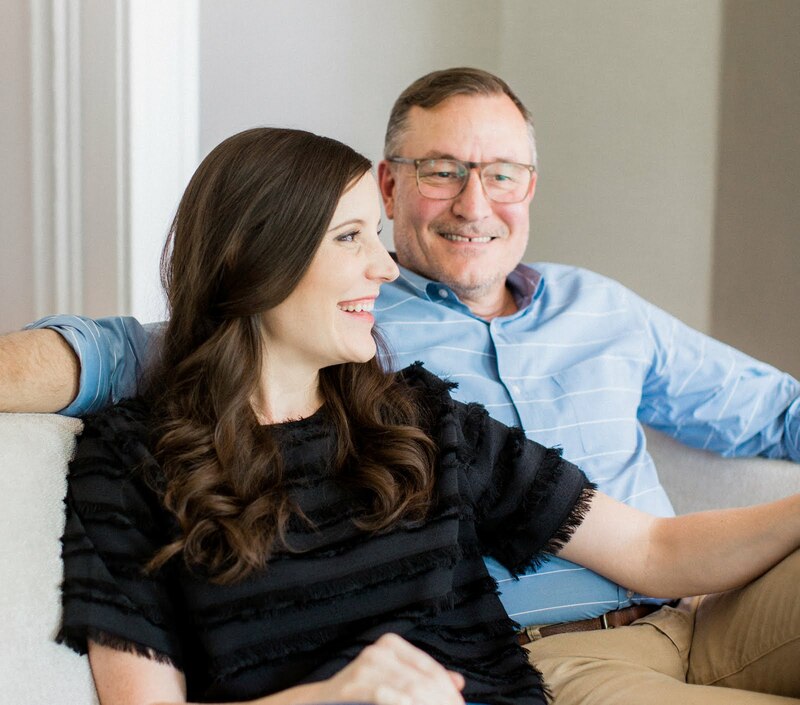 We're thrilled to be named among many blogs nominated for the Apartment Therapy "Homies Awards" in the DIY blog category. Should you have the time to spare a vote, we'd love yours for 17 Apart! Click here to vote. While over there, be sure to check out the plethora of other awesome DIY focused blogs — it's a pretty amazing list. P.P.S. A few folks have been asking after the progress of our avocado pit plants — we'll pop in with an update on them later in the week! We made the sweet potato chews and I kind of messed them up...cut them to thin and cooked them too long..hahaha! Round two will be this weekend. I just voted for 17 Apart and E.A.T.! Thanks for the vote Monica, you're the best! We felt like our chews were pretty flimsy at first too so we cut them thicker and it seemed to do the trick...just tool a LOT longer to dehydrate. We love pasta aglia e olio w/baby bok choy! You can grow ginger also. I already did that and the scallions. Thanks Irina! We are so curious to try a pineapple, how did it go for you? Any words to the wise before we take the plunge? How do you grow ginger like this? Pineapples take a very long time, close to 2 years for us and we're in a place that is sunny and hot year round. That said, they are a good looking plant (if a bit 'pokey'...the tips are sharp but take severe trimming well) and the fruit always tastes better to me. Probably that can be chalked up to pride in growing it ourselves. I've got close to two dozen in various stages, hoping that will eventually earn us a pineapple every couple of months. They take up a lot of space so I had some hanging pot holders made for the balcony and have them lined up out of the way. The fruit is lovely at the very beginning, purple and red and very cute. To start a pineapple, just unscrew the crown, let it dry for a week or so with the nub up in the air, then pull off the first 5 or so layers of leaves. You'll see dots on the bare flesh...that's where the roots will come from! Put it into a juice glass of water, changing the water every few days to avoid rotting. When you have some nice roots started, stick into the ground or a pot with sandy soil and good drainage. They don't like to stay too wet. Good luck! Thanks for your great ideas and re-encouraging me to do celery from the base again...didn't have luck last time but now I am heartened...and will do some bok choy, too. Jess! Thank you for the detailed info here — we are hoping to try a pineapple as one of our next projects. I'm so glad to hear you have had some success! When you say "transfer to its own container", do you still keep it in water, or do you put it in soil? When transferring to a new container, this is the point you want to plant directly into the soil! Romaine lettuce regrows as well. Thanks for letting us know — this is something we'd love to try! Thanks guys! I am trying that myself after reading your post. It is a bit slow, but getting there. I love it! Hey there. Did you wait to see if the bok choy had put out roots in the water container before you transferred the scrap to its own soil container? Or is it enough to just see the leaves growing to know that the scrap would survive and grow in its own container? No need to wait for roots - too much time in the water might soften and rot out the base (this happened to us at first), so as soon as you get a couple days of good leaf growth through the base I would go ahead and plant! I made an X cut on the bottom of the bok choy and the plant that emerged look noting like a typical bok choy for the store. It grew about 3 feet high and had stems with leaves, I am planning to try it in some green juice. Great news and sounds like some amazing success! What is the reason for cutting the X in the bottom? Does this help it to form roots? The centre stalk with leaves on it is the normal late stage form of both bok choy and romaine lettuce, the centre stalk should also eventually form flowers and seeds. My experience is the higher up the stalk they get the less I like these leaves, but I value both romaine and bok Choy for their crunch. Pineapple: Mine has only been potted for a couple of months, so no fruit yet, but this is how I did it. I simply cut the top off of the pineapple. I left it on the counter for a week or so and then stuck it into dirt. I watered it only once a week or so. At first it didn't look like anything was happening, but now its got new growth and looks healthy! I'm hoping to one day have a homegrown pineapple! We are hoping to get around to trying a pineapple soon. Thanks for the tips and please keep us posted with any successful advice! In HI they cut off the tops before canning and just throw the tops out into a truck. When the truck is full, they take them to the fields and toss them out. They are then just turned upright and nature regrows them to put on new fruit in 2 years! Does anyone know how to grow button mushrooms from a grocery store? It is not easy to regrow mushrooms from same, as they have to grow first underground for at least a year. They begin as spores from mature "rooms" and can actuallylive for many years in the soil. The best hunting in the wild is where the earth has been desturbed along roads and logging areas.The button "rooms" are generally grown in dark places in chicken compost. Did you change the water during the six days of growth? We changed the water every two days! Thanks for stopping by and taking a look. Good luck with yours! Very cool. 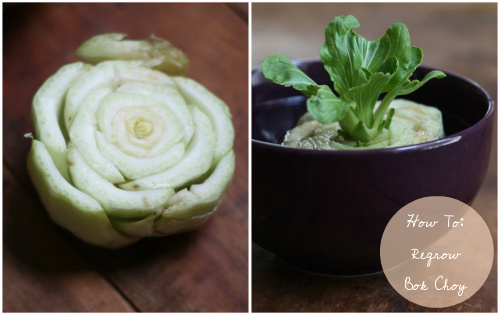 If you're growing bok choy, it works the same way. Just cut the plant near the ground and it will grow back for repeated cuttings. We do this with scallions too. Just keep some in a jar of water on the window sill and cut the tops as needed and they'll keep growing. Awesome - thanks for the tips Bill! Here's another one you can keep in water and grow - lemongrass! 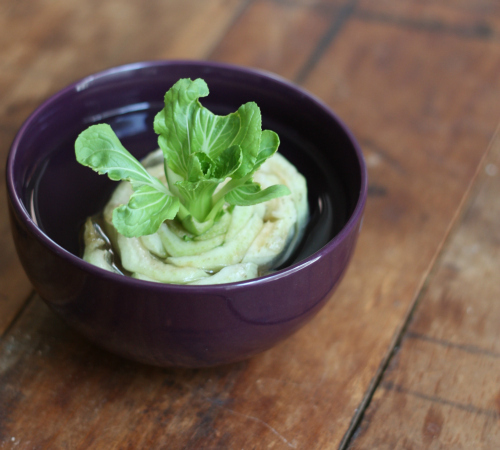 We cut off the base of a baby bok choy and put it in a bowl of warm water to sprout as directed. A week later it showed no sign of sprouting and was starting to rot, so we threw it away. Are some of them treated in the grocery store to prevent sprouting, or what? I know some garlic is treated with an anti-grow chemical, so possibly other vegetables are too. Try to grow buy an organic bok choy, and see if you get better results. Thank you for sharing your projects! I am growing bok choy and celery from their bases, but my bok choy did not sprout just one from the center -- it seems there are four or five little bok choys growing out of the base. Have you had this happen? I'm torn between cutting the base up and planting each of them separately, or snipping off the ones that already grew and concentrating on the centermost one. I haven't even moved this into a pot of dirt yet -- that should take place today. I did all the steps but when transplanted into a pot it gave me yellow flowers? Any suggestions? Should I cut them down? Gosh, I was excited when I learned about green onions in water...Bok choy would be amazing. Will keep checking back to see if there are problems with bolting. Going to try the celery and a bok choy as soon as I have a base. At what stage did you end up putting it in soil? How far up did you cover it with soil? I recently purchased some Bok Choy that had some pretty yellow flowers growing from the center. 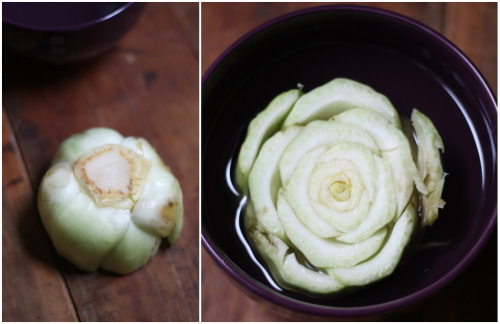 So after removing all the leaves to cook, I saved the base with the flowering center attached and put it in water. A week later it is still growing new flowers and leaves, but no roots. Should I go ahead and transfer it to soil anyway? Your bok choy has bolted. It has gone into the pase where it devotes its energy to making seeds. Bok choy like cool temperatures. The area that you put your bok choy may have been to warm for it. 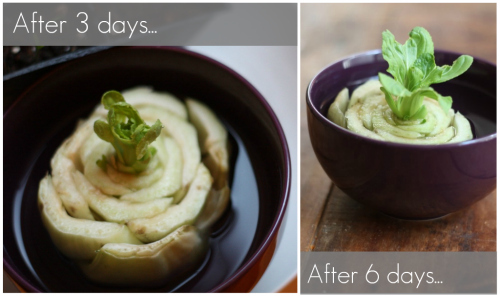 You can regrow romaine lettuce in the same manner. I have several pots of it in my plant room. It regenerates pretty fast too. I usually put it into soil after about 7-10 days. One of my Bok Choy scrap plants (tried 4 scrap. Only one succeeded)is growing nicely although it's snail food. I planted it out without root but keep the soil very well watered. Not sure I might try again in the future since the yield is not that good for the effort and the pest issue. I started growing my bok choy before I saw this article and it has grown very tall and now has yellow flowers...how do I get it so I can eat it's fat delicious leaves? All these basics sound easy but it seems the things I can grow are not so common. Was successful regrowing the bokchoy but when I transferred it to a planter they die. :( any tips? I managed to grow bok choy without soil (Just in a bowl of water) and it just keeps getting larger. We are going on a month now and it is the size of a small cabbage. There are many roots and I'm trying to figure out how long it would keep up with this growth with just water. Thanks so much for the gardening tip! It made me super excited about gardening! I was very successful for the first few days, with leaves sprouting out. But once I transferred from water to soil, they withered. Think I didn't transfer them well, or the soil was too wet. Gonna try again! I didn't even put the base in water and it started sprouting!! Had used the bok choy leaves in a recipe and left the base on a dish on the counter because I thought it was pretty--looks like a flower--and within a couple days it had started sprouting. Possibly my kitchen is just very humid...anyway I was happy to find your blog on a Google search as I wanted to figure out how to plant it! The celery post you guys did was super-helpful, so thanks! I started the bok choy upside down in a dish in my window sill and just turned it rightside up as the leaves are growing. I did start 2, but the first rotted. We also got the refrigerated starts from the local asian market and were directed by the owner away from the fresh for Pho. Not sure if that helps any, but I will check back in about the success. hmm tried it twice.. but still failed.. after 1 week.. the bokchoy is already rot and squichy.. plus smelly.. how you do that?